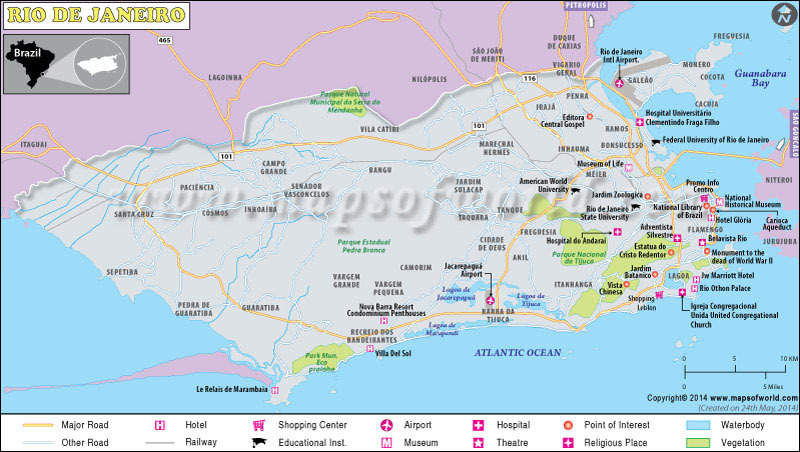 Explore the map of Brazil, the largest country in South America. The country got its name from the 'brazilwood' tree that was grown along the Brazil's coast. Ecuador and Chile are the only South American countries that do not share the border with Brazil. It is the only Lusophone (Portuguese speaking) country in America and also the largest in the world. Rio de Janeiro, also referred as Rio, is Brazil’s second biggest city and is the capital of the state with the same name. UNESCO designated a part of this city as a World Heritage Site on July 2012. Rio is one of the famous tourist destinations in southern hemisphere. Tourists come to this city to enjoy nature’s beauty, Rio carnival celebrations, balneario beaches, samba and Bossa Nova. The city also has the largest football stadium in the world, Maracanã Stadiums. Rio has been Brazil’s capital for about two centuries. The country’s second largest and world’s 30th largest GDP is generated by Rio. Rio’s harbour has an exceptional ocean entry which appears like the river’s mouth. It is located on the strip of Atlantic Coast of Brazil. Additionally, the marina is encircled by splendid rocky mountains and hills of Sugar Loaf, Corcovado Peak and Tijuca hills. These features collectively contribute in making this natural beauty as one of world’s seven natural wonders. The city’s population is around 11 million to 13.5 million and is spread in an area of approximately 1,183 sq km. The people living in the city are called cariocas. Rio, being one of the biggest transportation hubs of the country, is well connected from various countries and cities. Galeão - Antônio Carlos Jobim International Airport, referred as Galeão International Airport connects both domestic as well as international flights. The airport is located 20 kilometres away from Rio and the prime hotels. Another airport is Santos Dumont Airport is located near Guanabara Bay. One can get air-conditioned buses from the airport’s arrival section between 5:30am and 10pm every 30 minutes. Reaching the city by train is a little unlikely. The Central do Brasil (Central Station) serves the local commuters mostly. One can prefer the long-distance bus services for the journey. Apart from these, one can get the car facility on rent as the city is well connected by roads. The city has ferries, called as barcas, which connects the cities nearby like Niteroi. The city is welcoming year round. Anytime that suits an individual can turn out to be the best time of the year to visit Rio. The city has a moderate temperature all around the year. However, some seasons are better suited. The summers begin from December and go up till mid-March, where December and January are the hottest (40º C). One can experience the summer showers every afternoon. This is considered as the best vacation time as the Carnival and New Years Eve comes around this time. The winters last for three months – July, August and September. The temperature ranges between 24ºC and 15ºC. The spring lasts for only two months – September and October – with the temperature ranging around 26ºC. The autumn stays from April to May and June (26ºC). Rio has very good road connectivity. One can move around the city in a cab. The cabs have a yellow base colour with blue stripe on sides. The fare per kilometre is not very expensive, but the distance can be a lot. One car can accommodate four people. The cabs can provide city tours too for a fixed price. The taxi companies are Yellow Taxi, Central de Taxi and Ouro Taxi. One can also rent cars to cover the closer distances in the city. Maps would prove to be extremely helpful in this case. The other options for transportation are buses. The buses have a good frequency and are also high in number. The journey in buses is shorter as most roads have proper designated lanes for buses. Rio’s south zone has the best bus service. One can also use the metro for a pleasant travel. Conga is one mode of transport which has a proper and affordable transport option in Rio. The beaches are the best about this city. The clean water and sand can make any person feel peaceful. Some oceanic beaches are Leme, Vermelha, Copacabana, Arpoador, Ipanema, Leblon, Barra da Tijuca, São Conrado, Recreio dos Bandeirantes, Abricó and Grumari, and the bay beaches are Ramos, Flamengo, Botafogo and Urca. Rio’s official nudist beach is Abricó near Grumari beach. One can also visit the Praia da Moreninha beach on Guanabara Bay. One can also go see the world’s biggest stadium Maracanã stadium. A couple of places worth watching are Christ the Redeemer Statue, Corcovado, Pão de Açúcar, Lagoa Rodrigo de Freitas, Sugar Loaf Maracanã, Parque Lage, Jardim Botanico, etc. One can enjoy the paragliding, hang gliding, trekking, hiking, etc in this city too. One can also go for the panoramic flights in the helicopters. One can get the fanciest accommodation and a variety of hotels in Zona Sul which are along Ipanema beach and Copacabana beach. However, a number of cheap and economical hotels can also be found in and around Catete and Flamengo. Moreover, getting a cheap accommodation in the city is unlikely. However, one can see a huge difference in prices during the Carnaval and New Year. One can also look at cheap motels options at the outskirts of the city.